For two days we endure the whims of the infamous 420-mile-long Drake Passage while holding on to our port holes and wondering when our shaky sea legs are going to adjust to the watery roller coaster. The stoic, 2,000 ton M/V PROFESSOR MULTANOVSKIY (Marine Intrepid) navigates 60 degrees south latitude and slips into the Southern Ocean and the Antarctic Peninsula region where we are greeted by swooping sea birds and an overwhelming serenity. Ushuaia, Argentina, our gateway in Tierra Del Fuego at the tip of South America, seems far removed as Los Angeles as we prepare for the most humbling continent on earth. Captain Sergey Lebedev, who hauled Castro about during the Soviet years, said, "the Drake Passage is always in a foul mood like ancient mariners with a broken compass." No one just drops in on the Antarctic. The price of admission is the long journey to the end of the world and the last great unspoiled wilderness. 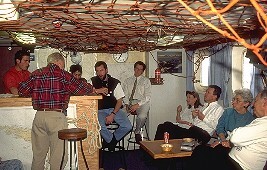 The passion of travel is surging through the converted Russian research vessel as 37 eager passengers listen to the intriguing natural history lectures that precede each landing. We learn that human kind has been humbled every step of the way with Antarctic names such as Deception Island, Cape Disappointment, Hope Bay and Danger Islands as stark reminders. There are no native people or commercial endeavors. Remote means thousands of square miles of ice on a continent twice as large as Australia, and some of it not yet mapped. We see our first ice shelf, flat and white, tucked between a full moon and a glorious sunrise. Pink and orange hues cover the sheer-sided slopes of Smith Island as brown-eyed fur seals pop up to take a look at us. Gigantic blocks of blue ice appear like a 21st-century cityscape, some larger than my hometown, as the wind-swept South Shetland Islands slide by in the glassy water. The MULTANOVSKIY sails to a narrow opening of the inner bay of Deception Island, a collapsed volcano summit ringed with snow-covered walls, for our first landing at Bailey Head on a glorious bright and sunny morning. The water temperature is 37F, the air, 25F, not bad for the middle of summer. We get dressed in the mud room, and are told the animals have the right of way; no smoking, take nothing, not even a feather, and leave nothing behind. The zodiacs, on an unruly swell, swing onto the black pebble beach where fur seals are basking in the sun along with 300,000 chinstrap penguins. Out of water, the penguins are Charlie Chaplin with sore feet, a snooty French waiter having a bad day, and a clunky old Ford with flat tires, while in the water they are a sleek, jet-propelled submarine. They can be rabble rousers and snippy copy cats while performing an endless "hippity-hop, follow-the-leader," but always fail to find one. Two hours later the MULTANOVSKIY carefully moves into the large, ocean-filled volcano at Port Foster and an abandoned whalers station used in the late 1800s. Bleached whale bones and rotting whaling boats, are foreboding. Near shore, the caldera is steaming the icy waters, an ominous sign that the caldera could erupt again as it has in the recent past. Later we spot a large pod of orca whales, two humpbacks and a minke frolicking through the clear green waters with the grace of ballet dancers, scattering penguins in all directions. On the bridge, in daylight at 9:30 p.m., travelers enjoy a two hour sunset and soft wonderful moments of pastel colors as the sun slides downward and the moon, looking like Swiss cheese, casts its own glow across the glassy water. Great growling chunks of glaciers tumble into the bay surrounded by towering mountains as we zodiac to Almirante Brown, an Argentine research base, where 23 smiling travelers step upon their seventh continent. Looking back at the ship through falling snow, we see the Captain casually diving into the 37F water for a quick swim. "In order to clear his head," he later explains. We climb the Mountain of the Cross for a snowy view and speak with Argentine researcher Jose Gallo, who proudly announces that he once visited California's Disneyland. Late in the day the zodiac weaves into Cuverville Island, past icebergs sculptured a hundred different ways; some resembling cityscapes, bridges and tunnels. 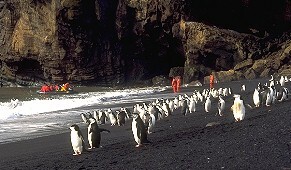 We beach at a rocky point where nesting gentoo penguins are proliferating their species. A crab eater seal is snoring, while skua birds and gulls are drifting in air currents that are swirling about the glaciers. Vistas are of mountains, ice fields, sheer ice cliffs hundreds of feet high, and drifting clouds bullied by an ever-changing climate that adds to the illusion of endless space. 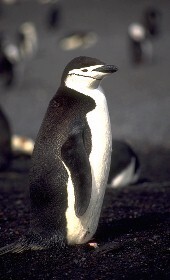 At Half Moon Island in the southern ocean, a large chinstrap penguin rookery is thriving along with seals, nesting Antarctic terns and giant petrels. We made eight spectacular landings in six days, finally stopping at King George Island and Bellingshausen to bid farewell to eight passengers who volunteered to stay there for three days to help clean up the Russian research center. We pass near the rainy Cape Horn as we hump along like an inch worm to Ushuaia when, suddenly, six acrobatic dusky dolphins are riding the white, churning wake at the bow of the ship as if it were a toy. With a wave of their tails, it was an Antarctic goodbye. Marine Expeditions, a Toronto-based company, offers affordable, all-inclusive Antarctic Expedition adventures on six former Russian research vessels that have been adapted for passenger use. 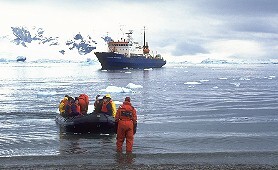 Small groups led by naturalists board zodiacs for landings on the continent and islands. Marine Expeditions, 13 Hazelton Ave., Toronto, Ontario, Canada, M5R 2E1; (800) 263-9147; Fax: (416) 964-2366.